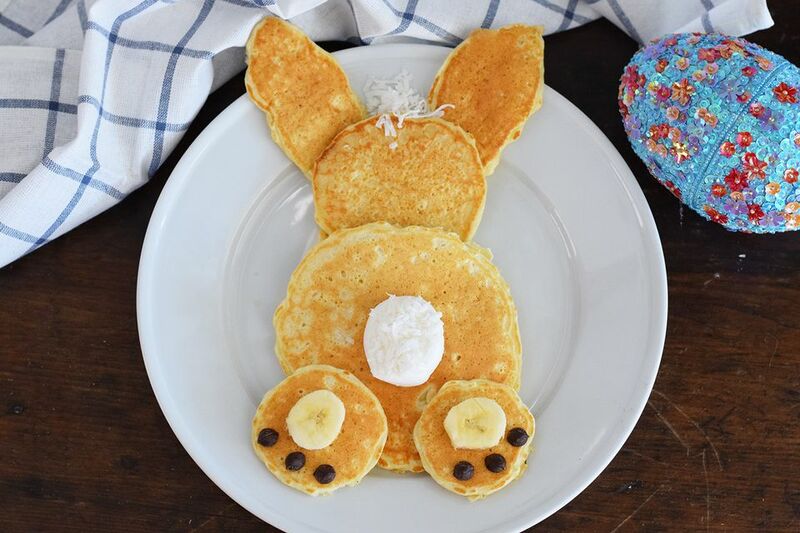 These bunny-shaped pancakes are wonderful for an Easter morning treat when you have little ones. Or when you are indulging your inner child. We're not here to judge. The adorable little fluffy bunny tail is incredibly easy to make and you don't even need any special tools to shape the pancakes! Just serve these delicious pancakes with regular syrup or try a homemade strawberry or raspberry syrup. If you're in a rush, you can even make this recipe even simpler by using a pre-made pancake batter. Heat up a cast iron griddle or pan on medium heat before you begin cooking. Get it nice and hot and then turn down the heat right before you begin cooking the cakes. Beat together the egg, milk, and melted butter in a measuring cup. If you are adding vanilla, add it in at this time too. Make sure the butter has cooled to room temperature before adding the egg so that it doesn't start to scramble! Whisk the flour, baking powder, sugar, and salt in a large bowl. Stir in the wet ingredients. The batter should be a little lumpy. Don't over beat the batter or it will not stay fluffy and will result in a bit of a tougher pancake. Let it sit for about 5 minutes. It will puff up, if it is too thick, add a little more milk. If it looks too wet add in a tablespoon of flour. Butter the griddle right before you are ready to cook the pancakes. Spoon 1/8 cup of the batter onto the griddle to form the head. Spoon more batter into two ear shapes. Add a little more batter to create the largest circle, which will be for the body. Create two smaller circles for the feet. Cook on the griddle for a few minutes per side. You will know they are cooked when the bubbles stand still and stop refilling with batter. Repeat until you have enough shapes for four bunnies. Keep the finished pancakes warm in the oven (200 F) while you are making the remainder of the pancakes. On a large plate, begin assembling the bunny. You will need one plate for each bunny. Start by placing the two ears towards the top of the plate, layer the medium circle on the bottom edges of the ears. Then layer the large circle on the edge of the head. Then add the two smallest circles on the bottom edges to create the feet. Place a round of banana on each foot and place three chocolate chips under each banana to create the foot pads. Place the half of the marshmallow on the lower half of the body. Place some of the shredded coconut on the marshmallow and between the bunny ears. Serve with butter, syrup, or other toppings!